Bad TV is designed to create a realistic analog bad tv distortion like in the olden days before digital television. Time Control: Automatic mode animates the time automatically along the timeline. Manual mode means the time can be animated manually. Distortion Mode: The distortion at the edges. Stretch mode stretches the edge pixels all the way to the edge, where as Tile mode repeats (tiles) the pixels. Signal Distortion: The amount of signal based distortion. Simulates an analog poor reception. Scan Distortion: Creates the wavy distortion. 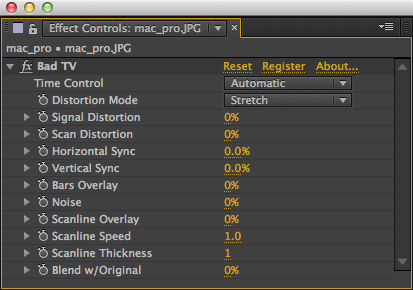 Horizontal Sync: Makes the scan go out of sync horizontally. Vertical Sync: Makes the scan go out of sync vertically. Bars Overlay: Overlays contrasting bars that move. Useful to simulate ghosting. Noise: Creates a noise overlay on the image. Scanline Overlay: Creates scanlines on top of the image. Scanline Speed: Control how fast the scan lines are moving. Can be negative to make them move in the opposite direction. Scanline thickness: Control the thickness of the scanlines.